Thugs of Hindostan is going to release this Diwali. As we all know that the mega starrer movie, Thugs of Hindostan is going to release this Diwali, the excitement among the fans has gone to the next level. It would be the first time that Aamir and Amitabh would be seen together in a film. To make it more exciting and give the audience the flavour of reunion the perfectionist, Aamir and Shehenshah of Bollywood Amitabh would be reuniting on the small screen before the release. Both of them would be seen together in Kaun Banega Crorepati. The show is hosted by Amitabh Bachchan and they promoted the upcoming film “Thugs Of Hindostan”. "What an exciting day I have had! Just finished shooting for 'KBC' with Mr Bachchan. Had so much fun. Sir, sorry for all my requests! Couldn't control myself," Aamir tweeted with a selfie from the sets of Kaun Banega Crorepati. 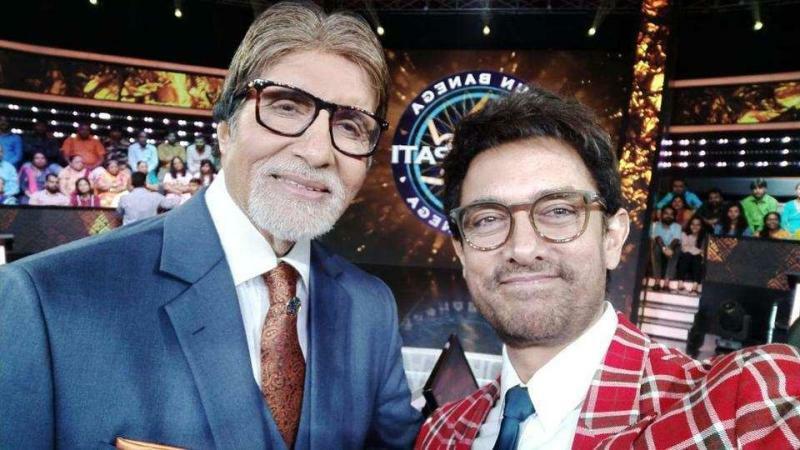 Aamir is wearing a red chequered coat and a pair of glasses and on the other hand, Amitabh looks dapper in a classic blue suit. Aamir Khan talking about his character in the film said during an interview with South China Morning Post in April and said, “Thugs of Hindostan is a big action-adventure film. There’s no message in that. I am playing a character who cannot be trusted at all – [so it’s the] very opposite of Dangal … He’s a very slippery character. He has no scruples at all – for money he can sell his mother out. He’s like that,” he said about the role. “But [the character] is a very entertaining guy. So it’s a very entertaining kind of a film. No message this time. Just have a good time,” he added. The film "Thugs of Hindostan” is directed by Vijay Krishna Acharya which seems to be entertaining film with some mind-blowing visual effects. Katrina and Sana Shaikh are also the part of the film. The film is all set to release on November 8.